The New Testament was originally written in Greek and was subsequently translated into Latin by Jerome in the 4th century in a version called the Vulgate. Latin was the universal language of the Roman Catholic Church, and the New Testament was only freely available in Latin or Greek until the Protestant Reformation of the 16th and 17th centuries. In an attempt to produce a Bible that could be read by ordinary people in their own language, John Wycliffe translated the Latin Vulgate version of the Bible into English in 1382. As the Roman Catholic Church disapproved of uneducated people reading and interpreting the Bible for themselves, this resulted in laws banning any new translation and forbidding the reading of the Bible in English. 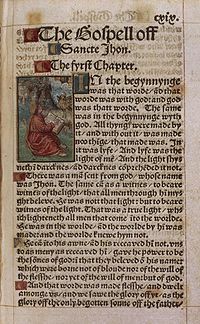 Despite this ban, William Tyndale produced the first English translation of the New Testament from the original Greek in 1526. His aim was to enable ‘any ploughboy’ to read the Bible in his own language. Tyndale’s translation was unpopular with the Roman Catholic Church hierarchy as it clearly showed some translation errors in the Latin version, and thereby questioned the authority of the church in certain doctrines and practices. Printed copies of Tyndale’s translation were burnt, and Tyndale himself was executed. In 1535, reformers within the newly created Church of England persuaded King Henry VIII to allow a complete Bible in English. Tyndale’s colleague, Miles Coverdale, added his own translation of the Latin Old Testament to a modified version of Tyndale’s New Testament, suitably revised to make it polically acceptable. The so-called Matthew’s Bible of 1537, edited by John Rogers, also included parts of the Hebrew Old Testament that had originally been translated secretly in prison by Tyndale. The official Great Bible of 1539, approved for use in the Church of England, was a mixture of the Matthew’s Bible and Coverdale’s version. Other English versions followed quickly. The Protestant Geneva Bible of 1560 (often quoted by William Shakespeare), and the Roman Catholic Douai-Rheims Bible of 1582, reflected different doctrines and practices derived from the original Greek New Testament and the Latin Vulgate respectively. The 1568 Bishop’s Bible was an attempt by Church of England bishops to combine Protestant doctrine and Catholic ceremony. The King James Version (the ‘Authorised Version’) of 1611, was a similar attempt at compromise. Rather than being a new translation, it was assembled from older translations such as Tyndale’s (which forms over 80% of the King James New Testament), Coverdale’s, the Geneva Bible and the Bishop’s Bible. While supporting Protestant doctrine (e.g. calling for ‘repentence’ rather than ‘penance’), it reflected the Catholic hierarchy and ceremonial of the Church of England (e.g. appointing ‘bishops’ rather than ‘overseers’, and substituting ‘church’ where the Greek ‘ekklesia’ means an ‘assembly’ or ‘congregation’). The King James Version was the most commonly used English translation until the publication of generally more accurate, but less poetic, translations from the 1950s onwards. These include the Revised Standard Version (1952), the New English Bible (1961), The Living Bible (1971), the Good News Bible (1976), the New International Version (1978), the New Revised Standard Version (1989), the English Standard Version (2001) and The Message (2002). The Biblical quotations in The Bible Journey are taken from the New Century Version (Anglicised Edition) (2010).